By Spencer. 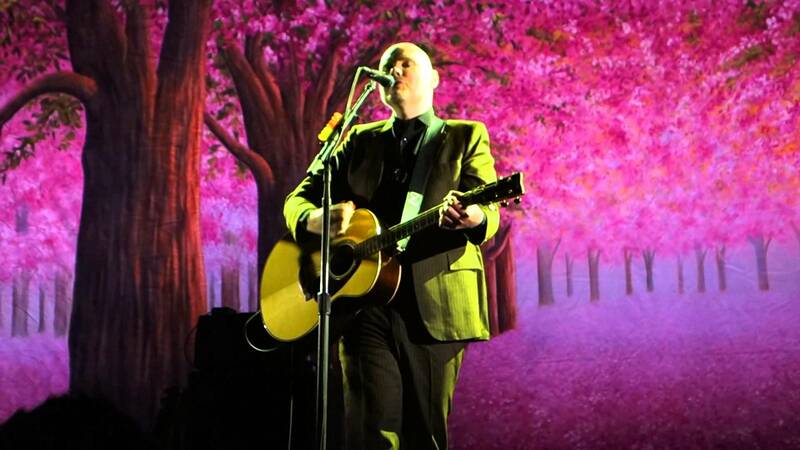 When Billy Corgan announced that the Smashing Pumpkins would be doing a special acoustic tour of small, intimate theater venues called In Plainsong, I was intrigued. When he announced Jimmy Chamberlain would be returning on drums, I was sold. The Pumpkins were my favorite band growing up. They were my very first rock concert (way back in 1994). This would be my fourth time seeing them live, but my first since their initial breakup in 2001. It was a chance to reconnect with all the teenage angst that Billy Corgan so perfectly voiced during the 90s. But just like I have grown in the years since, so have the Pumpkins—and the “acoustic-electro” concept behind this show would be a chance to see them in a newer, more mature light. The Pumpkins have always been known best for their signature guitar distortion, but the tradeoff in that is that it actually obscures just how talented a guitar player Corgan is. Behind an acoustic guitar, though, his status as a minor virtuoso has nowhere to hide, veering effortlessly between percussive strums, intricate finger picking, and melodic leads and lending his songwriting a beauty that no doubt surprised more casual fans. Corgan stayed solo for the first twenty minutes of the set, bringing in Mellon Collie favorites like “Stumbleine” (strummed rather than finger-picked for a little extra power) and “Tonight, Tonight.” He was then joined by guitarist Jeff Schroeder for a cover of David Bowie’s “Space Oddity” that won over the crowd. With Bowie’s recent death and Corgan’s longtime idolization of rock stars with self-constructed alter egos, it wasn’t a surprising choice. But the show would be heavy with other, more unconventional cover choices, including Natalie Imbruglia, The Rolling Stones, and oddly enough, Hole’s “Malibu” (which, to be fair, was co-written by Corgan and Courtney Love). And though they may not count as covers, it was a shock to hear songs from Corgan’s long-forgotten 2005 solo album, Thefutureembrace, and his short-lived Pumpkins follow-up, Zwan. Corgan and Schroeder were briefly joined onstage by opener Liz Phair, who contributed backup vocals on the wistful “Thirty-Three.” From there, the band went into an extended set of songs from their 1993 masterpiece, Siamese Dream. Fan favorite “Mayonaise” has always worked well as an acoustic ballad, but “Soma”—typically played as an epic rocker along the lines of “Stairway To Heaven”—was impressively refashioned for this tour, putting Corgan on the electric organ and bringing the full band onstage for the first time. Chamberlain’s drumming in particular adds an unpredictable energy that Corgan’s music has always needed, and his rapid-fire fills on “Soma” or on the minor key coda to “Whir” transformed an acoustic show into something more complex—a full-on rock experience. From organs to bass to electric guitars, the setlist gradually incorporated a growing arsenal of instruments and sounds, evolving by the midway point into a satisfying marriage between acoustic subtlety and just the right amount of noise. Nowhere was this more evident than during a brief three-song electronic interlude of rarities from the Adore era, including Eye, a song from the soundtrack of the David Lynch movie, Lost Highway, that might be the closest the Pumpkins ever came to sounding like Nine Inch Nails. Shedding his guitar for these songs and joined onstage by a pair of backup singers, Billy shimmied behind the microphone stand like the glam rock star he’s always secretly wanted to be. And while the song choices admittedly seemed a little out of place for the night’s theme, they also offered a stark expression of the diversity of genres that Corgan has worked in over the years. Without them, the show would have been an incomplete picture of the band, but including them, you hear a sampling of all the different sounds that comprise the Smashing Pumpkins style. Naturally, 1979 made an appearance as the perfect single-song distillation of all these different sonic facets, and the crowd couldn’t have been happier. But I think a lot of people were genuinely surprised by the charms of a lesser-known track from the band’s later era, “Stand Inside Your Love,” impressively restyled to give backup vocalist Katie Cole the lead, with Corgan trading vocal harmonies with her. I’ve long thought this is one of the band’s most underrated songs, but hearing it this way, I honestly think it works even better; Cole’s delicate vocals give the song a fragility it desperately needs. The main set closed with another new song, “The Spaniards”—an energetic pop rock song with dual guitars solos and a fine melodic hook for a chorus. Returning for an encore with The Rolling Stones’ “Angie,” Corgan lingered at stage’s edge a while to wave goodbye—an honest, human moment for a show that seems tailored to reclaim those sentiments. In a time when music frowns upon such open feeling, you might say we needed it. Nice write-up. Glad the show fulfilled your hopes. Nostalgia is a tricky beast! Now, I’m going to nerd-out on you and correct a couple of things. “World’s Fair” is not new — it’s from a cycle of acoustic songs (Chicagosongs?) from post-Zwan. Some really good stuff from that. Also, the Natalie Imbruglia is not really a cover because Corgan wrote that song for the Stigmata soundtrack. I didn’t know “The World’s Fair” and the internet said it was new. This may have been the first time it’s ever been an unreliable source of information! Makes sense about the Imbruglia song … it didn’t really sound out of place, though I had no idea he’d ever worked with her.